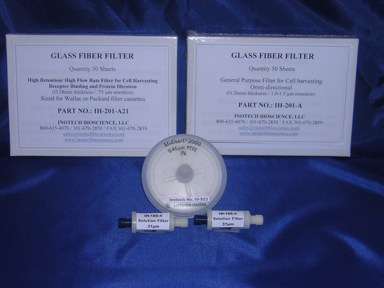 Inotech Glass Fiber filters are custom made to the highest quality standards and are suitable for a variety of cell harvester and molecular activities. The Inotech IH-201-A is an Omni-directional general purpose filter for cell harvesting with a 0.26mm thickness and 1.0-1.5 µm retention. Sold in boxes of 50. The Inotech IH-201-A21 is a high retention/high flow rate filter for cell harvesting, receptor binding and Protein filtration with a 0.38 mm thickness and a .75µm retention. Sized for Wallac or Pcckard filter cassettes. Sold in boxes of 50. Midisart® 2000 (0.45µm)filtration units are ideal tools in biotechnology, the pharmaceutical industry, research institutes and anywhere you need sterile vents, bioisolation or sterile air and gases. Midisart® 2000 excellent for - sterile venting of filling vessels and fermentation carboys, including culture vessels and CO2 incubators (6 to 120 liters) - venting of holding tanks for sterile, distilled water and liquid culture media - autoclave venting - in-line sterilization of and particulate removal from air and gases, such as sterilization of air for small fermenters. Sold in packs of 4. The Inotech IH-186-4 Filtertek Inline Nylon Screen solution filters are designed for use in a number of different applications, including cell harvester wash lines. The housing design withstands higher pressure situations and is resistant to alcohol and fuel with a retention rating of 31 µm. Sold in packs of 5 filters.